There are many types of WordPress users, but it mainly boils down to two—those who know WordPress inside and out (typically developers) and those who merely use the content management system to power their websites but know very little about it on a technical level (typically bloggers). The second group of people are attracted by the sheer amount of themes and plugins available for WordPress as well as its capabilities as a blogging platform, but they don’t know the first thing about security or keeping a WordPress site up to date. That’s where WordPress maintenance services come into play. WordPress maintenance services are companies that offer to keep your site clean, monitor its performance and keep everything up to date in exchange for a small (typically monthly) fee. They’re great for bloggers and site owners who don’t have the time to maintain their own sites nor have the time/patience to learn. 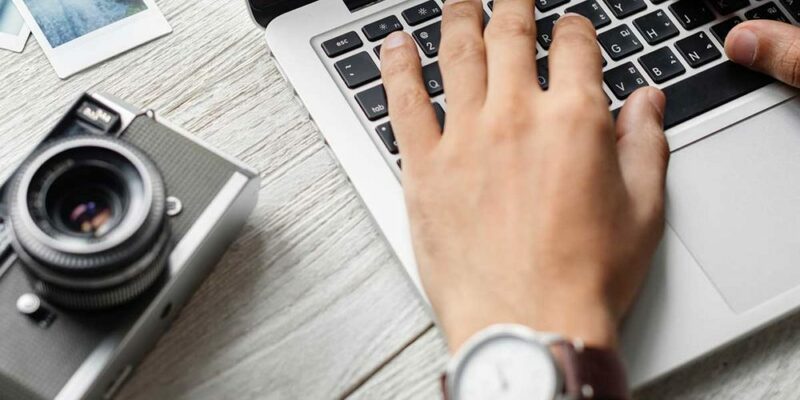 In this post, we’re going to cover what WordPress maintenance services are, why you might need one and alternatives you can use. We’ll also, of course, go over a list of some of the best services available. 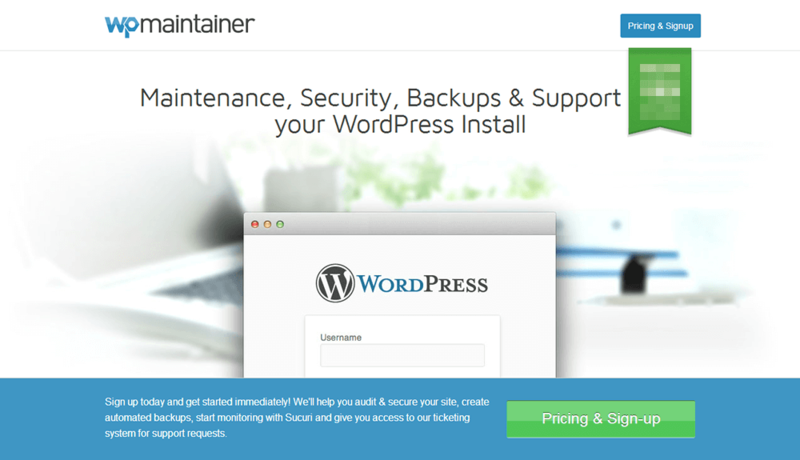 What are WordPress Maintenance Services? I provided a brief explanation of what WordPress maintenance services are, but I didn’t really explain exactly what they do and why they’re beneficial. Let’s start with that latter part. If you have a WordPress site, you should be aware of the relative way it works by now. What I mean is, you should have figured out that WordPress is a self-hosted platform, which means it doesn’t provide security services outside of being built with secure code nor does it update your site, themes and plugins for you. You’re required to do all of this and fix bugs on your own. Cool, but what happens if you’re busy producing content and spend the rest of your time at a day job and on all of the other responsibilities life brings? What happens if you simply don’t care about being a “WordPress expert” and find your time is much better spent continuing to grow your blog and business. Well, you probably won’t keep your site up to date, implement security features/plugins, or keep your theme and plugins up to date. You may find your site has been hacked, doesn’t perform as well or is riddled with bugs after a while. 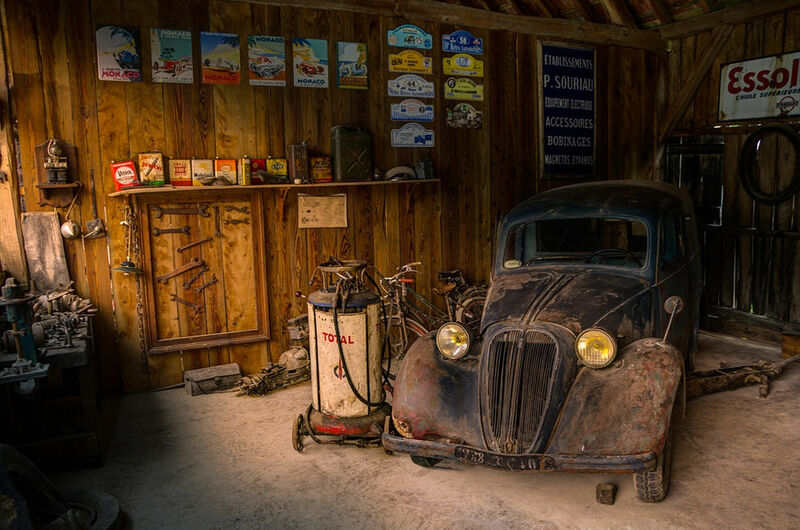 If you do decide to perform your own maintenance, you may wind up doing so incorrectly, introducing a number of different bugs you’re unsure of how to get rid of. These are nightmares a WordPress maintenance service can keep you safe from. Those are the basic services you’ll see almost every WordPress maintenance service offer. Some offer more, others offer less. We’ll get into the specific services each one offers in the list below. First, let’s go over who this type of service targets. Keeping your WordPress site updated in an improper way or not keeping it up to date at all is a surefire way to introduce bugs and malicious code from hackers, as explained earlier. In short, security features, WordPress updates, careful installations of new themes and plugin, and updates for those themes and plugins must be implemented. How you go about implementing them doesn’t really matter. When you don’t feel like cooking, what do you do? You pay someone else to do it for you. WordPress maintenance works in the same way. Anyone who does not wish to perform maintenance on their own site regardless of their knowledge in WordPress. Site owners who don’t know how to perform maintenance on WordPress sites. Site owners who do not wish to learn how to perform maintenance on WordPress sites. Site owners who are not confident in their ability to perform maintenance on their sites correctly. In that vein, you can see why this type of service is targeted toward busy bloggers and business owners more than anyone else. With that said, let’s go through our list of maintenance services. We’ll cover alternatives afterward. Note: Prices recorded in May 2018. Let’s kick off this list. 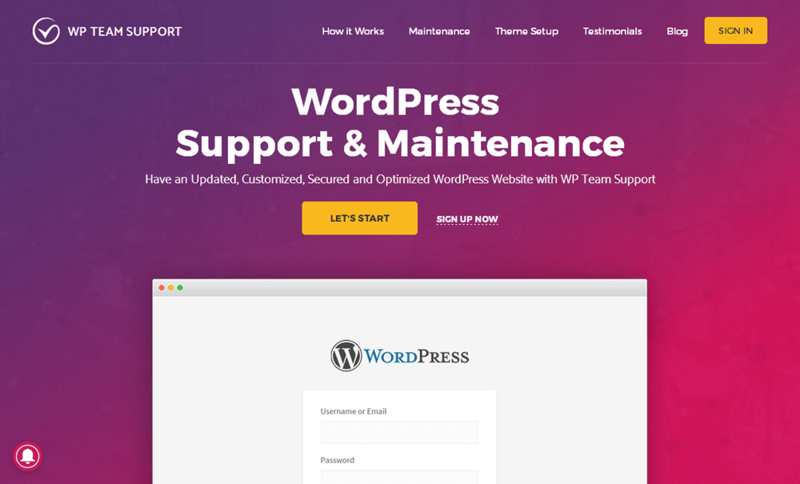 WP Team Support is another WordPress maintenance service that offers services for a wide range of businesses. Some of the features it offers for larger businesses are SEO optimization, performance optimization and custom development. Again, we’re going to focus on what it offers bloggers. For that, we’re going to take a look at their Startup Plan. For starters, scheduled backups are taken periodically and stored in the cloud. Managed WordPress updates are performed as well. Security monitoring is offered 24/7, and cleanups are available as well should hackers or malicious code seep into your file system. Additional services include uptime monitoring, spam cleanup and monthly reports. Urgent support is available via live chat, but a ticket system is available for less pressing issues. This plan is $49/month, and a 30-day, money-back guarantee is available. 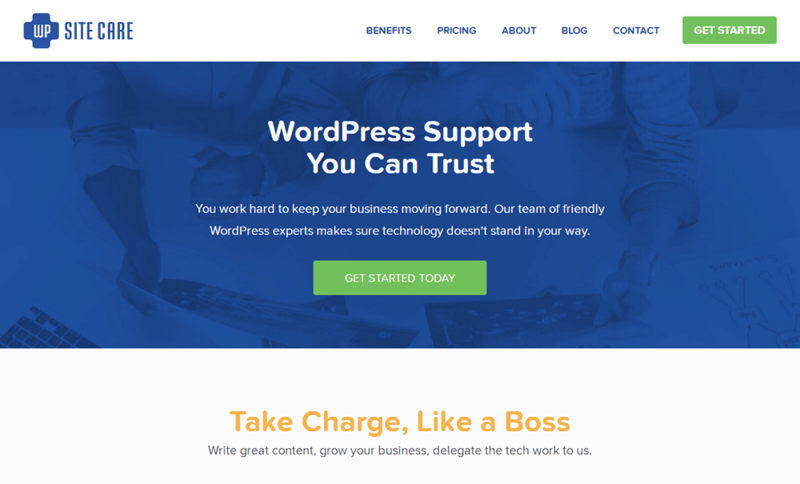 WP Site Care is a maintenance service that offers a long list of features for businesses of all sizes, whether you’re a blogger, small business owner or a much larger company. Services for larger businesses include custom development available every month, an account manager and more, but let’s focus on what it offers bloggers and small business owners. For these services, we’ll be looking at WP Site Care’s Core Plan. Services start with daily backups that are stored securely in the cloud database Amazon Web Services offers. After that, you’ll enjoy safe and secure updates of your themes, plugins and WordPress core. You’ll even enjoy 24/7 security monitoring and hack cleanups through a partnership with Sucuri, a popular security solution for websites. They also offer support through your WordPress dashboard, which is a pretty unique feature. Pricing for this plan is $99/month or $948/year (comes with three free months). There’s also a 30-day, money-back guarantee. 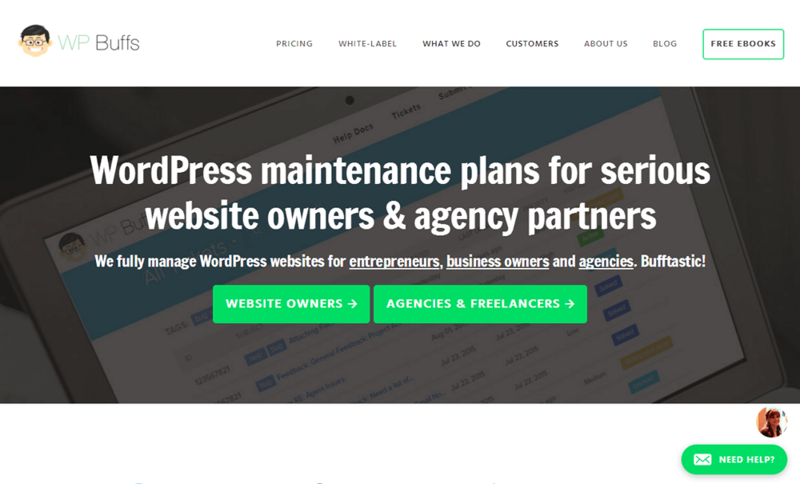 Maintainn is another WordPress maintenance service that offers several different plans, though its higher-end plans don’t offer as many premium features as the other two services. It does, however, offer custom development in some of its plans. The Premium Support plan is what bloggers should be interested in. Backups are taken on a daily basis and stored offsite. WordPress updates are also offered on a weekly basis to help keep your site secure. 24/7 security monitoring is also available, as are fixes and cleanups should your site become hacked. Maintenance reports are also provided on a monthly basis. As for support, you can either email the support staff or submit a ticket through the support widget available on your WordPress dashboard. Pricing for this plan is either $49/month or $499/year, the latter of which comes with two free months. WP Maintainer offers maintenance services for a variety of different businesses with a single plan. Their tagline for this new pricing strategy is, “Everyone gets our best service. New low price. No complicated packages.” Services start with backups that can be emailed to you or stored offsite. They’ll also update WordPress core, themes and plugins, being sure to take new backups before beginning the update process. Similar to the first service in our list, security monitoring and site cleanups are offered and powered by Sucuri. Email and ticket support are available, but certain requests may be subject to additional fees. Pricing for WP Maintainer’s single plan is $99/month. 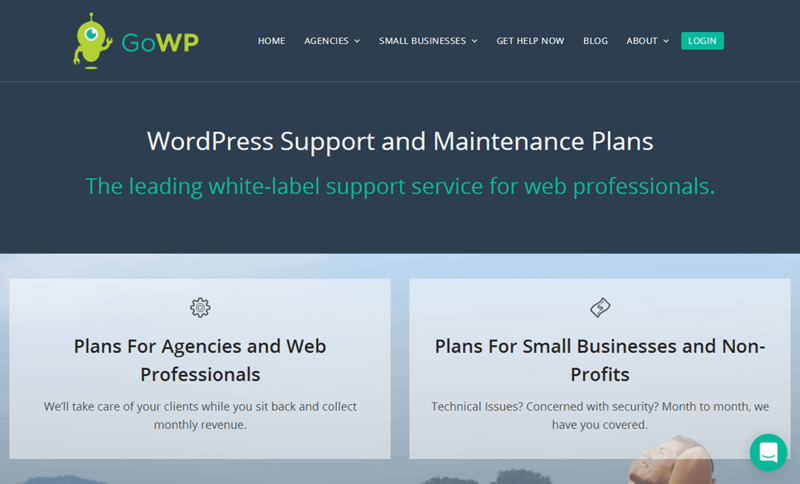 GoWP is another WordPress maintenance service that caters to small business owners and agencies, though the prices it offers to each are the same. We’re going to focus on the small business plans. It offers four different plans. The first two cater to different needs, and you can combine the services they offer by subscribing to the third plan. Let’s elaborate. The first plan is the Maintenance plan. It’s available at $29/month. It offers daily backups that are stored offsite and can be used to restore your site when requested. It also offers updates for WordPress core and plugins. It even includes security scanning on the frontend, and site cleanups are available if problems are found. The second plan is the Support plan, and it’s available at $59/month. The only feature it offers are an unlimited number of 30-minute support tasks. If you subscribe to the third plan, the Complete plan, you’ll receive everything offered in the Maintenance and Support plans at $79/month. The fourth plan, the Manual plan, offers all of this plus manual plugin updates and testing at $129/month. You can also purchase fixes on a one-off basis for what’s typically $49/task, though prices do vary. WP Buffs is yet another WordPress maintenance service that caters to a broad audience by offering a wide range of services. As always, let’s focus on the services it offers general website owners. There are three plans that can be paid on a month-to-month basis or annually. Most bloggers are going to be interested in the first two plans. The third plan is expensive at $150/month, but it does come with malware removal. The first plan, called Maintain, offers daily backups that are stored in the cloud. Website restorations are also available. Updates are also offered for themes and plugins on a weekly basis. 24/7 uptime monitoring and weekly reports are also available. This is offered at $50/month. Security monitoring is available through an integration with iThemes Security Pro when you subscribe to the Perform plan or higher. This plan is $100/month and also comes with weekly speed optimizations. Support is available via live chat, email and phone. Let’s talk about two additional WordPress maintenance services that didn’t make our official list before we wrap this article up. 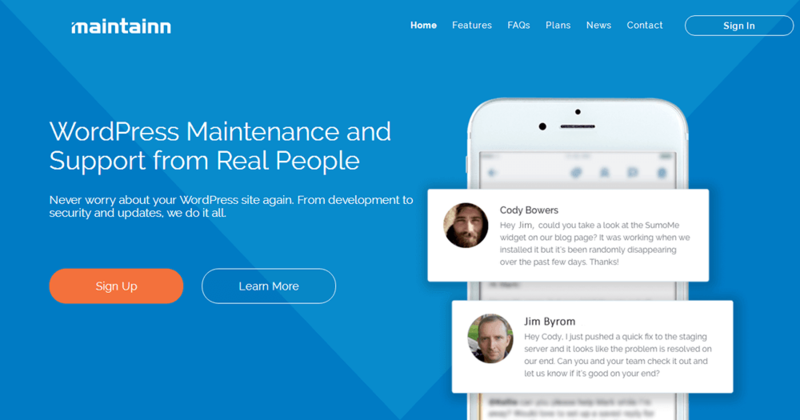 The WP Butler is a WordPress maintenance service that offers customizable plans. You can add each individual service to your plan rather than purchasing all in one solutions. For example, if you only want weekly WordPress updates, you’ll only pay $16/month. If you want weekly full-site backups with daily database backups, you’ll only pay $15/month. If you want both, you’ll pay $31/month. 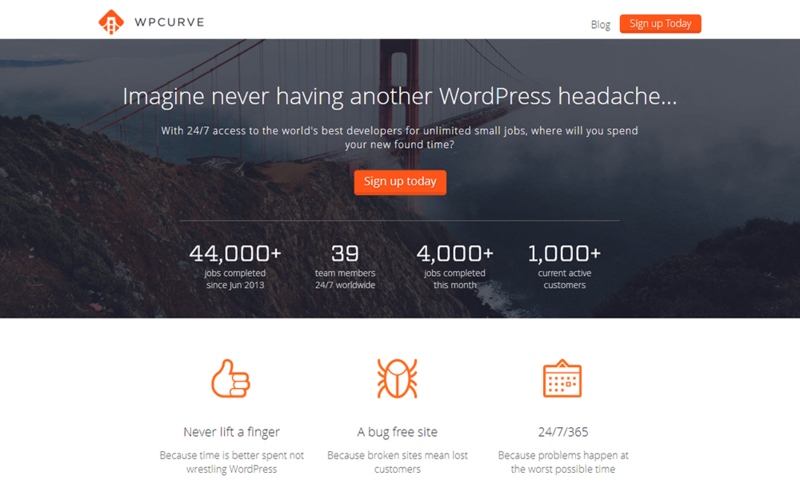 WP Curve is a WordPress maintenance service that offers services in a unique format. First, its services are offered in a catalog where they’re known as tasks. A few of these tasks include theme maintenance, WordPress development and administrative development. Each plan you purchase with this service gives you a certain number of credits. Each credit can be used to buy one task. Credits are available through plans. The first is the Starter plan, available at $49.99/month. The second is the Basic plan, available at $79.99/month. WordPress maintenance is something every site owner needs to take seriously. No amount of security monitoring, firewall rules and other features can keep hackers at bay if you aren’t updating WordPress core, themes and plugin files regularly and correctly. That’s why WordPress maintenance services are so useful. They allow you to focus on producing content and managing your business without having to worry about whether or not your site is falling apart internally. There are a couple of alternatives to these services, however. The first is to simply learn how to take your own backups, implement security solutions and perform updates yourself. The second one is much more helpful. It allows you to receive these services from your host. It’s available through a type of hosting called WordPress managed hosting.